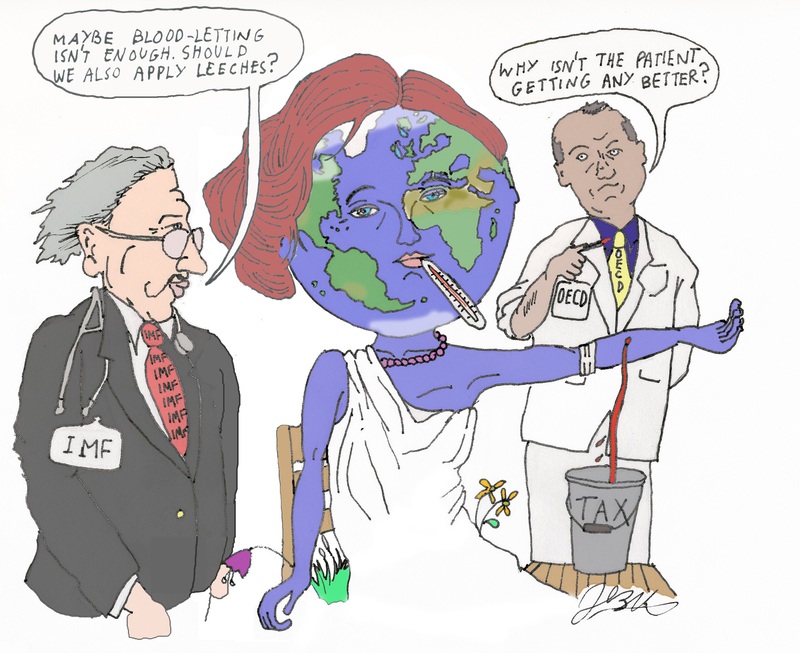 The International Monetary Fund is one of my least favorite international bureaucracies because the political types who run the organization routinely support bad policies such as bailouts and tax increases. But there are professional economists at the IMF who do good work. While writing about the mess in Argentina yesterday, for instance, I cited some very sensible research from one of the IMF’s economists. Today, I’m going to cite two other IMF scholars. Serhan Cevik and Fedor Miryugin have produced some new research looking at the relationship between firm survival and business taxation. Here’s the basic methodology of their study. 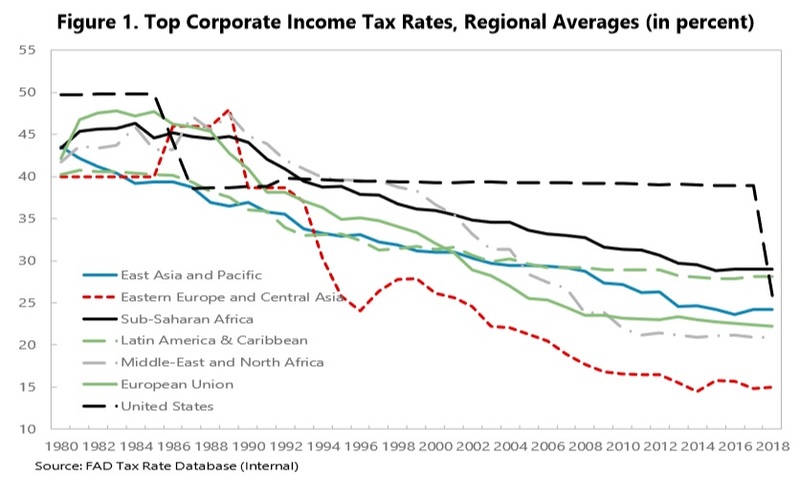 While creative destruction—through firm entry and exit—is essential for economic progress, establishing a conducive ecosystem for firm survival is also necessary for sustainable private sector development… While corporate income taxes are expected to lower firms’ capital investment and productivity by raising the user cost of capital, distorting factor prices and reducing after-tax return on investment, taxation also provides resources for public infrastructure investments and the proper functioning of government institutions, which are key to a firm’s success. 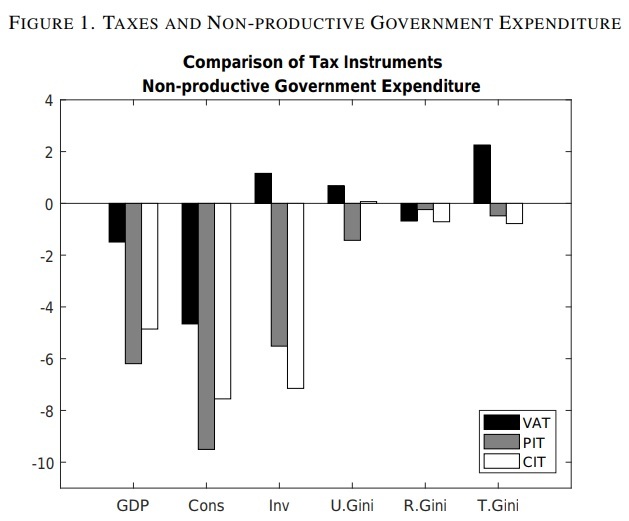 …the overall impact of taxation on firm performance depends on the relative weight of these two opposing effects, which can vary with the composition and efficiency of taxation and government spending. … In this paper, we focus on how taxation affects the survival prospects of nonfinancial firms, using hazard models and a comprehensive dataset covering over 4 million nonfinancial firms from 21 countries with a total of 21.5 million firm-year observations over the period 1995–2015. …we control for a plethora of firm characteristics, such as age, size, profitability, capital intensity, leverage and total factor productivity (TFP), as well as systematic differences across sectors and countries. By the way, I agree that there are some core public goods that help an economy flourish. That being said, things like courts and national defense can easily be financed without any income tax. And even with a very broad definition of public goods (i.e., to include infrastructure, education, etc), it’s possible to finance government with very low tax burdens. Let’s focus on the study. As you can see, the authors grabbed a lot of data from various European nations. And they specifically measured the impact of the effective marginal tax rate on firm survival. Unsurprisingly, higher tax burdens have a negative effect. We find that the tax burden—measured by the firm-specific EMTR—exerts an adverse effect on companies’ survival prospects. In other words, a lower level of EMTR increases the survival probability among firms in our sample. This finding is not only statistically but also economically important and remains robust when we partition the sample into country subgroups. 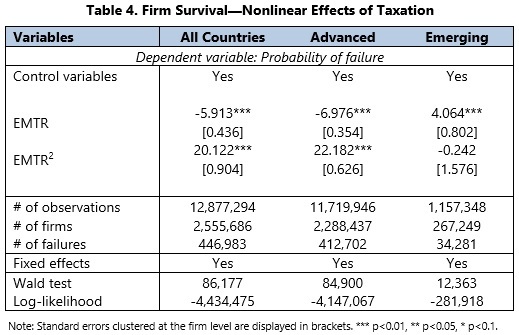 …digging deeper into the tax sensitivity of firm survival, we uncover a nonlinear relationship between the firm-specific EMTR and the probability of corporate failure, which implies that taxation becomes a detriment to firm survival at higher levels. With regards to the impact of other firm characteristics, we obtain results that are in line with previous research and see that survival probability differs depending on firm age and size, with older and larger firms experiencing a lower risk of failure. For those that like statistics, here are the specific results. Here are the real-world implications. Reforms in tax policy and revenue administration should therefore be designed to cut the costs of compliance, facilitate entrepreneurship and innovation, and encourage alternative sources of financing by particularly addressing the corporate debt bias. In this context, the EMTR holds a special key by influencing firms’ investment decisions and the probability of survival over time, especially in capital intensive sectors of the economy. Importantly, the challenge for policymakers is not simply reducing the statutory CIT rate, but to level the playing field for all firms by rationalizing differentiated tax treatments across sectors, capital asset types and sources of financing. There are some obvious takeaways from this research. 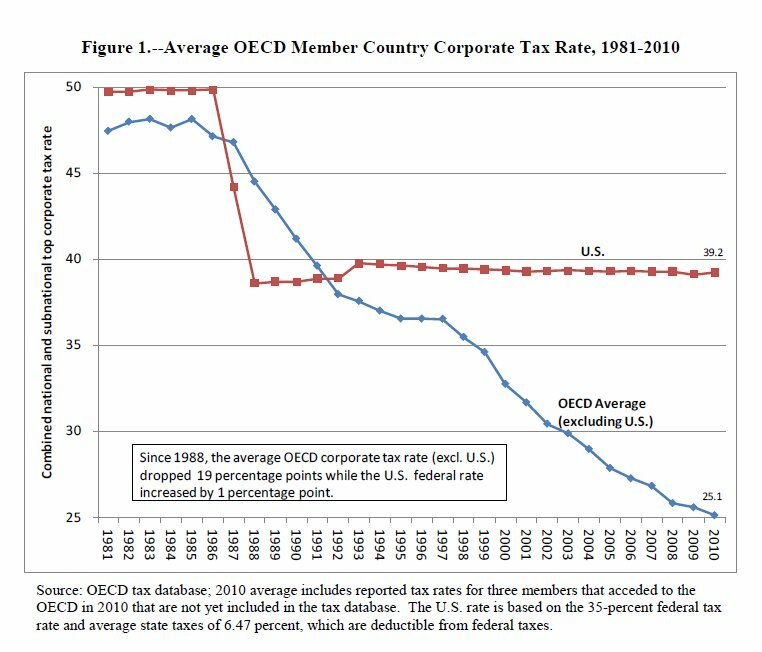 First, it’s a very good idea to lower corporate tax rates. Second, it’s a good idea to treat all businesses the same. Third, it’s a good idea to treat debt and equity alike. For what it’s worth, this IMF study basically embraces the sensible principles of business taxation that you find in a flat tax. Too bad we can’t convince the political types who run the IMF to push the policies supported by IMF economists! There were several good features of the 2017 tax bill, including limitations on the state and local tax deduction. But the 21 percent corporate tax rate was the unquestioned crown jewel of the Tax Cut and Jobs Act. The U.S. system had become extremely anti-competitive thanks to a 35 percent rate that was far above the world average, so reform was desperately needed. The bad news is that Democrats in the House of Representatives already are pushing for a big increase in the corporate rate. Rep. John Yarmuth, the new House Budget chairman, said his chamber’s budget blueprint will aim to claw back lost revenue by boosting the corporate tax rate from its current 21 percent to as high as 28 percent… he anticipates the budget resolution will envision changes to the 2017 GOP tax overhaul, including raising the corporate tax rate above its current 21 percent. “…We’ll see how much revenue we can get out of it.” The rate was 35 percent before it was cut in the GOP tax bill. Since Republicans control the Senate and Trump is in the White House, there’s probably no short-term risk of a higher corporate tax rate. But such an initiative could be a major threat after the 2020 election, so let’s augment our collection of evidence showing why a higher rate would be a very bad idea. 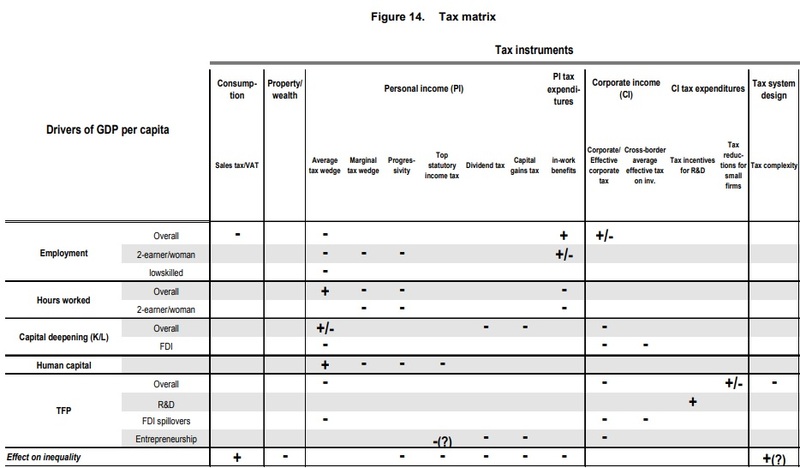 We’ll start with some analysis from the number crunchers at the Tax Foundation. 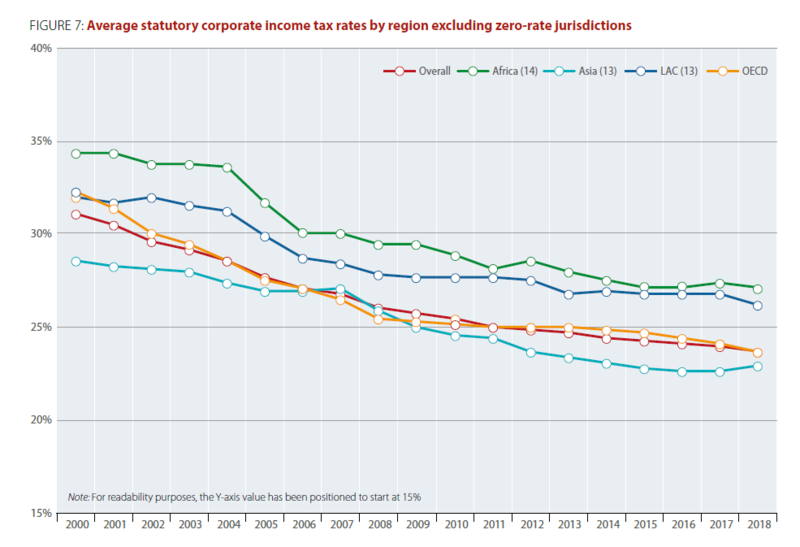 A corporate tax rate that is more in line with our competitors reduces the incentives for firms to realize their profits in lower-tax jurisdictions and encourages companies to invest in the United States. Raising the corporate income tax rate would dismantle the most significant pro-growth provision in the Tax Cuts and Jobs Act, and carry significant economic consequences. 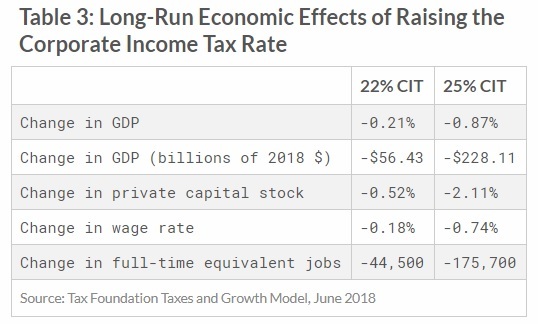 …Raising the corporate income tax rate would reduce economic growth, and lead to a smaller capital stock, lower wage growth, and reduced employment. …Raising the rate to 25 percent would reduce GDP by more than $220 billion and result in 175,700 fewer jobs. Here’s the table showing the negative effect of a 22 percent rate and a 25 percent rate, so a bit of extrapolation will give you an idea of how the economy will suffer with a 28 percent rate. 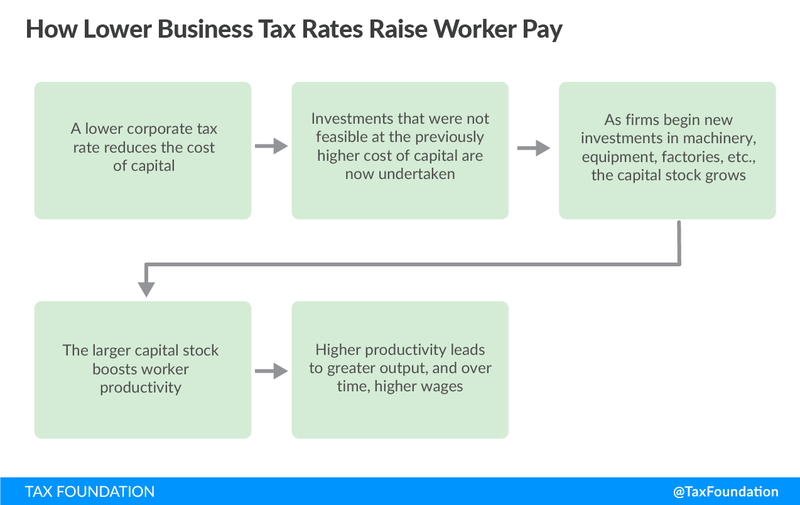 By the way, since the adverse impact on wages is one of the main reasons to be against a higher corporate tax rate, I’ll also share this helpful flowchart from the article. Now let’s look at some research from China, which underscores the importance of low rates if we want more innovation. Here’s the unique set of data that created an opportunity for the research. In November 2001, China implemented a tax collection reform on all manufacturing firms established on or after January 2002, which switched the collection of corporate income taxes from the local tax bureau to the state tax bureau. 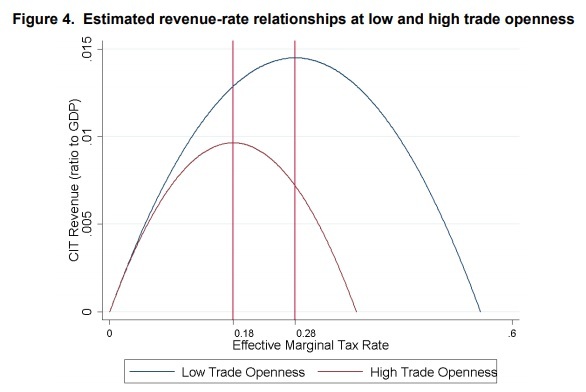 After the reform, similar firms established before or after 2002 could pay very different effective tax rates because of the differences in the management and incentives of those two types of tax bureaus…, resulting in a reduction of effective corporate income tax rates by almost 10% among newly established firms. …the policy change created exogenous variations in the effective tax rate among similar firms established before versus after 2002. We can thus apply a regression discontinuity design (RD) and use the generated variation in the effective tax rate to identify the impact of taxes on firm innovation. And here are the findings. Our analysis yields several interesting results. 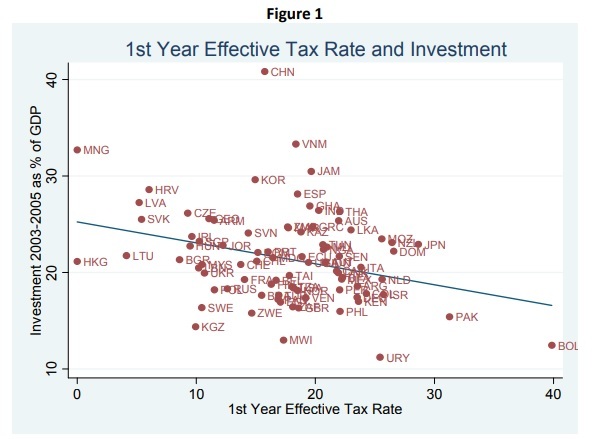 First, we show a strong and robust causal relationship between tax rate and firm innovation. Decreasing the effective tax rate by one standard deviation (0.01) increases the average number of patent application by a significant 5.7% (see Figure 2 for the graphical evidence). The reform also stimulated R&D expenditures and increased the skilled-labour ratio by 14%. Second, a lower tax rate also improves the quality of patents. 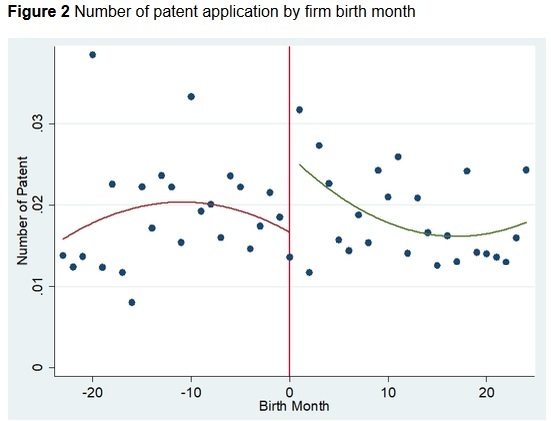 The impact of tax reform on patent applications mainly comes from its effect on invention and utility patents – decreasing the effective tax rate by one standard deviation improves the probability of having an invention patent application by 4.4% and increases the number of utility patent applications by 4.7%. Don’t forget that high personal tax rates also discourage innovation, so it’s a pick-your-poison menu. Here’s a chart from the study, showing the difference in patents between higher-taxed firms and lower-taxed firms. Last but not least, let’s review some of the findings from a study published by the National Bureau of Economic Research. And here’s one of the many charts and tables in the study. 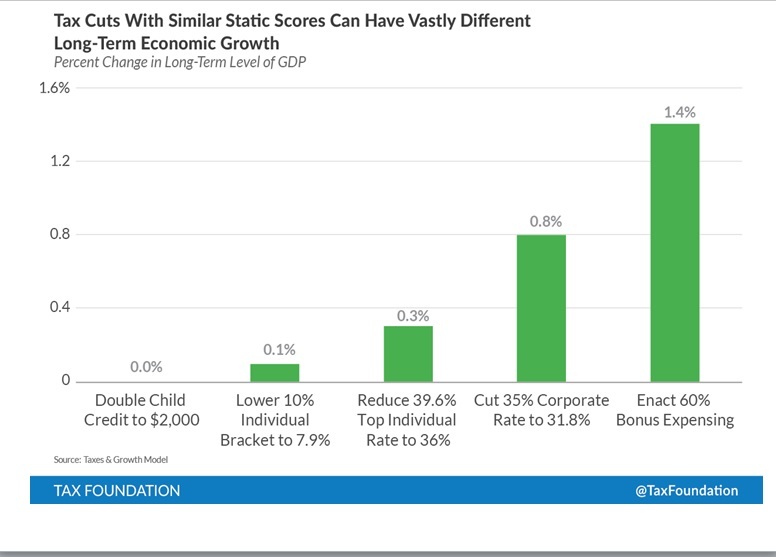 The bottom line is that a higher corporate tax rate will be bad for workers for the simple reason that less investment means lower productivity and lower productivity means lower wages. P.S. It’s also likely that House Democrats will try to increase the top personal tax rate, though hopefully they’re not so crazy as to push for Ocasio-Cortez’s 70 percent rate. P.P.S. 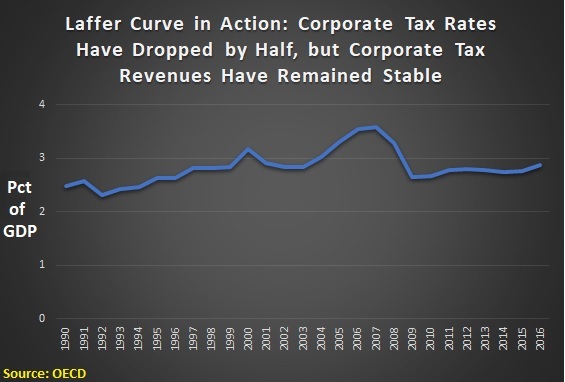 it’s quite possible that an increase in the corporate tax rate would reduce revenues, especially in the long run. US investment in Ireland declined by €45bn ($51bn) in 2017, in another sign that sweeping tax reforms introduced by US president Donald Trump have impacted the decisions of American multinational companies. …Economists have been warning that… Trump’s overhaul of the US tax code, which aimed to reduce the use of foreign low-tax jurisdictions by US companies, would dent inward investment in Ireland. …In November 2017, Trump went so far as to single out Ireland, saying it was one of several countries that corporations used to offshore profits. “For too long our tax code has incentivised companies to leave our country in search of lower tax rates. It happens—many, many companies. They’re going to Ireland. They’re going all over,” he said.